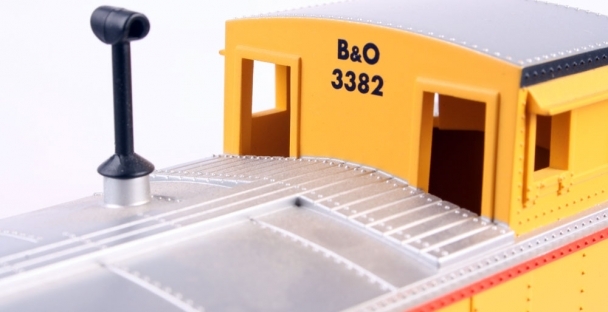 The Industrial Rail caboose is an oddball in the product line. Its size, although reported to be 027, was actually closer to 1:55 scale. Its small body, placed on the standard IR trucks, make it look awkward and out of place among the other 027 proportioned IR trains. A caboose is a specialized train car often coupled at the end of a freight train. These cars were designed to provide accommodations to members of the train crew and carry such emergency equipment as lanterns and signal devices. Often, the caboose contained kitchen and sleeping facilities. Although cabooses were once used on nearly every freight train in the United States, they are a rare sight on today's modern trains.